Congratulations Joe - well played and well deserved win! Another long game played over two settings. 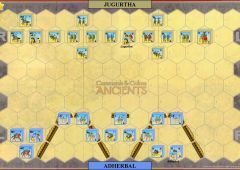 Roman artillery fire extremely accurate all game, but most damaged Epirotes got away. Initial Epirote Cav attack killed LI and damaged another, but lost a War and cav reduced to 2 and 1 point units who fled. 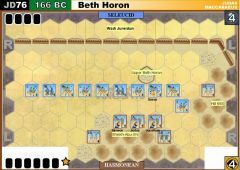 On Roman left, Epirote missile units and skirmishing killed a LI, Aux and MI for loss of HI. The Roman Cav on Right moved up as the Epirote counterparts hid. Roman cav chrge scatterd light units while opportune Epirote Counterattack surrounded and killed the Roman Cav. Later Roman surge in Center unable to close before Epirote phalanx killed 2 MI on Right center, pulling last 1 pt MI from wll. Lots of 1 pt Eprirote units left. Tens game, thanks to Tony for great match. A long game and very back and forth. 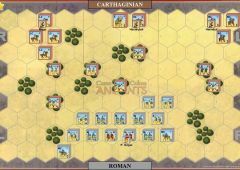 The Romans initially came forward to battle and the Emirates not having center cards could not repulse them. However, the Romans backed toward there palisade giving the Epirotes a reprieve. 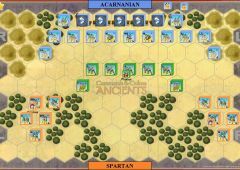 There was quite a bit of ranged attack in this game with the Romans having a low hit rate and the Epirotes a higher hit rate. The Roman left flank was the site of the majority of the fighting. 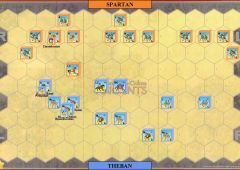 The Epirote cavalry charge was quite uneventful and Roman counterattack and double time were able to almost take the win. Epirote Clash of Shields ended the fighting. The Romans had the Emirates on their heels for most of the game. 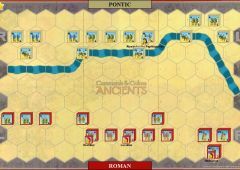 In a desperate move the Epirote left flank advanced on the Romans and were able to cause significant damage. The Romans were able to close and cut threw the Epirote Right flank to end the battle. 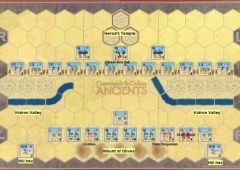 Romans had poor communication for 1st 3/4 of battle with Order heavy and Light cards. The Epirotes relentlessly advanced. 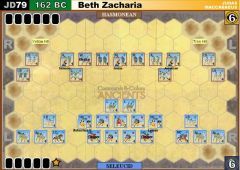 Small counterattacks by the Romans were minimally successful. 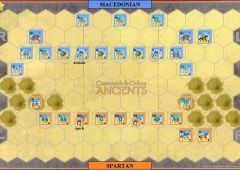 As Epirotes battered the Roman right flank with little hope for the Romans, communications improved with a double time and Clash of Shields. enabling them to crush the Epirote Left flank. Nail biting games. Thanks to Greg for the excellent plays. Thank you so much Giulio, I've just updated it! I've grouped all MT59 VLOGS over here (for faster download and reference). Game 2 Gonzo (Epirote) 6 banners, 35 kills, Guilio (Roman) 3 banners and 18 kills. Epirote missile fire on target all game. 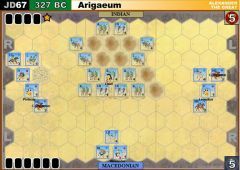 Early critical roll was 3pt Roman MC with leader vs 2pt Epirote MC with leader in front of Roman lines with pinned one pt Roman LI beside them. Roman only got one hit. 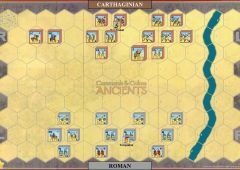 BB and subsequent attacks by the Epirote 1 pt MC killed both Roman units which was the only chance for him to survive, although the MC was subsequently killed during an Evade. Still a three banner swing. Traded effective missile fire, but Epirote got the better of it. Epirote HI and Ele advanced on the right, eliminating support for the Roman HI and leader there. Ele did damage before killed, then Epirote HI finished the Roman HI for the last banner. Romans on verge of 2-3 more banners breaking the center, but ran out of time. Gonzo rolled very good 1/6 in this game. Thanks to Guilio for excellent match. Lots of maneuvering both games with no first strikes or Doubletimes. Early Epirote Cav charge disastrous with loss of Ele and one cav and damaged others. Missile fire from both sides followed by wildly fluctuating dice in melee. Two points of damage on Epirote HI and MI negated with Rally, but subsequently rooled all banners and the beat up Romans mostly got away. Traded blows and banners until the end. Close with plenty of all hit and no hit rolls. Cavie wrote: Started with the usual ranged shots from both sides and ended with 3 Double Times (one Counter Attack) in the middle to really stack up the banners. Some interesting rolls with 5d - one roll missed on every die which almost ended it for Alexander and then the ending roll from Hiero of 5d that hit with every die on a battle back to end the game. It has been fast and intense. I really enjoyed this game. Thank you all guys for your patience waiting for my game. Indeed, all Semi-finalists are now revealed, and the matches are assigned. Quite a generous due date due to Christmas, but good if they can be finished earlier. And a Happy and safe Christmas to all! So it seems we know the semi-finalists from our group (Tony and Greg O)! Started with the usual ranged shots from both sides and ended with 3 Double Times (one Counter Attack) in the middle to really stack up the banners. Some interesting rolls with 5d - one roll missed on every die which almost ended it for Alexander and then the ending roll from Hiero of 5d that hit with every die on a battle back to end the game. A closely fought game with even dice rolls. I was able to get the win when a warrior with leader got some consecutive move cards on his right and aided in the destruction of most of this flank. Very enjoyable against a fine opponent.